When Stuart Gordon’s Re-Animator arrived in 1985, it set a benchmark in horror-comedy that few films have matched since. The movie has spawned two so-so sequels to date (with House of Re-animator arriving in 2008) and helped establish Gordon as a vital name in the genre. Loosely based on a series of minor stories by HP Lovecraft, the film sees brilliant young scientist Herbert West developing a serum that can re-animate dead tissue. With the assistance of his unwitting housemate Dan, West sets about experimenting on fresh corpses with inevitably gory results. That Re-Animator is so much more successful than other horror-comedy concoctions is mainly down to Gordon’s excellent handle on the tone. The script is genuinely witty (“You’ll never get credit for my discovery…who’ll believe a talking head?”), but importantly it never descends too far into camp over-the-top hysterics, with Dan’s voice of reason providing a nice counterbalance to West’s lunacy. Gordon is clearly influenced (though not spoofing) the heyday of 1950s mad scientist movies like The Tingler, and there are plenty of nods to Hitchcock too – just check out the great Saul Bass-style credit sequence! Richard Band’s score also basically plays out like one long homage to Bernard Herrmann (for which he has been criticised in the past for, but Band maintains is entirely intentional). But despite such references, Re-Animator is a tirelessly inventive and original horror in its own right and which belies its low-budget origins. The movie is packed with one memorable scene after another, such as Herbert’s late night revival of a dead cat or the glorious final showdown. But it’s more than simply about the set pieces. Unlike the vast majority of low-budget horror flicks, Re-Animator actually features well-crafted characters and decent acting. Abbott and Crampton are both believable and likeable as the young couple caught up in the madness and Gale is a blast as the sleazy professor who walks around minus head for half of the movie. But of course it is Coombs who steals the show as the calmly bonkers West, and you can’t see the film working with anybody else in the role. 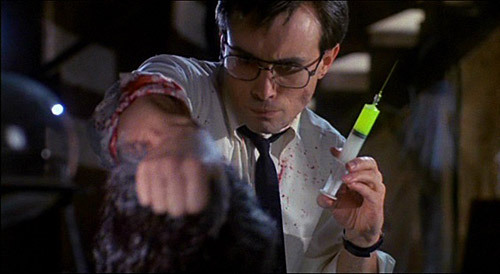 Witty and ingenious, Re-Animator may be low budget but it sure isn’t cheap. A true work of mad genius. This new special edition is crammed with neat extras – in the Region 1 limited edition you even get a marker pen in the shape of a syringe! On the first disc, there is the choice of two commentaries. One features producer Brian Yuzna and actors Coombs, Abbott and Crampton fondly remembering their time on the movie. It’s fun for a bit, but you don’t get any great insight beyond “this is so funny!” Much better (though drier) is Gordon’s commentary. He gets a little too caught up describing his medical research for the movie in intricate detail, but you learn some interesting things like the fact he “ripped off” the ending from Stephen King’s Pet Semetary. On disc two the extras are exhaustive – interviews with the key figures behind the film along with a chat with Fangoria editor Tony Timpone, extended scenes and a 70-minute documentary on the film. It’s a lovingly put together DVD, and pretty much an essential purchase for horror buffs.